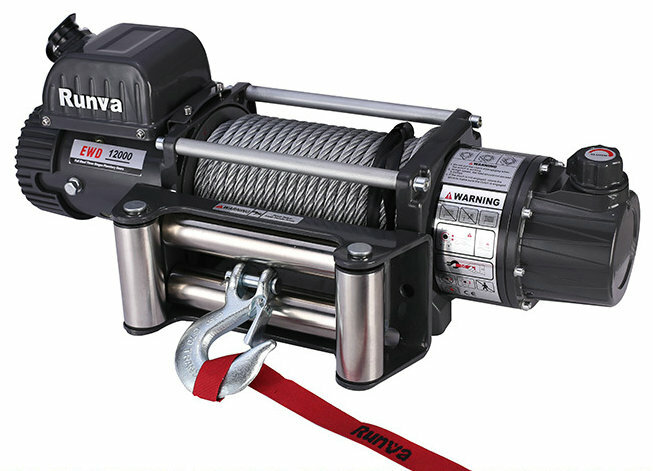 Electric winch is now a common vehicle tool, I believe many people will buy one, in case of need. So how do you install the winch? First, determine the position of the installation tray in your car. The principle must be (1) effective: the winch is directly applied to the chassis of the car during use through the pallet, and does not change the overall performance structure of the car. (2) Safe: Pallets and winches and control boxes do not affect the structure of the gas path, oil circuit, etc., and the air-conditioning structure that is easily overlooked. Fix the winch in the center of the pallet steel groove, pay attention to the direction of the winch, and the steel cable enters and exits from the lower part of the winch cable shaft, and fixes the rope guide to the pallet baffle. Untie the steel cable strip (be careful to prevent the cable from popping out), pull the cable head out of the middle of the rope guide, and attach the cable hook. Install the electrical control box in the appropriate position, connect the winch power supply, and press the red and black color separation lines to connect another pair of wires to the car’s power supply. Open the waterproof cap of the electric control box control interface, and insert the control handle plug into the electrical control box interface indication. Test machine: Check whether the vehicle power supply voltage is accurate with the working voltage of the winch, whether the capacity is sufficient, whether the pallet, winch, rope guide and electric control box are firmly installed, the power cable, the control cable are connected correctly, and do not cross the steel cable. contact. Wear work gloves, pull the cable out to the target, clean the site, and test the winch. Is it easy to install? Try it yourself!